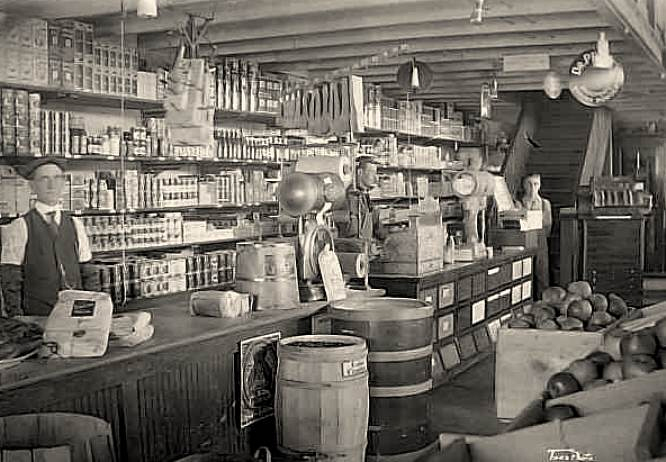 But a century ago, grocery shopping was an entirely different experience for your grandma or great-grandma. Until a pig changed everything. 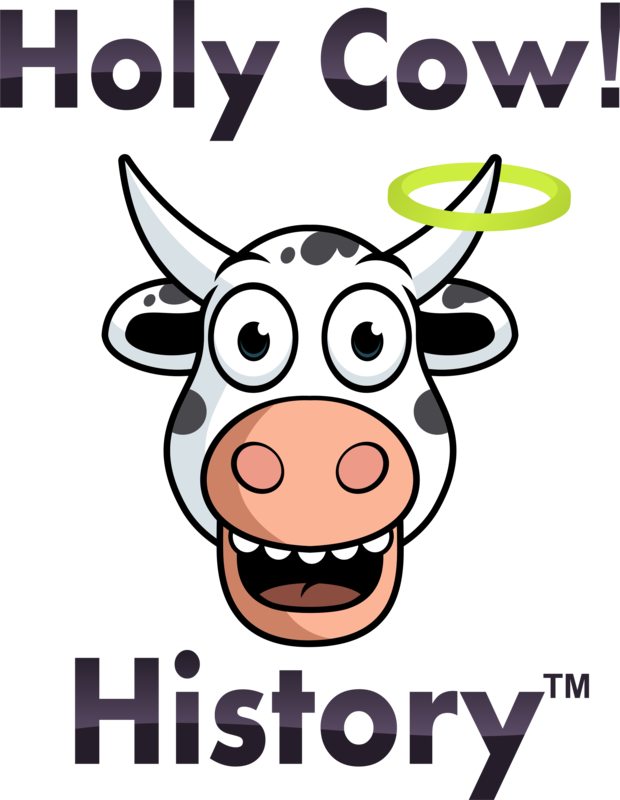 The concept was radically different from anything tried before and it worked so well, we’re still using it today. Here’s how it happened. Back in 1916, a trip to the market was both time-consuming and costly. Products were stacked behind counters. If you wanted an item, you asked a clerk to get it for you. Staples such as flour, sugar, and coffee were kept in large barrels. If you wanted a pound of something, it was scooped by hand, weighed, and wrapped. And there were no carts or buggies; you brought your own basket from home to tote the items you selected. Needless to say, that system was painfully slow. Waiting never makes for happy customers. Plus hiring all those clerks added to the bottom line, too. Then Clarence Saunders had a better idea. He was in interesting character. With only two years formal schooling, he educated himself by extensive reading. He worked a series of odd jobs: sawmill hand, general store clerk, and grocery wholesaler. In that last occupation he found his life’s calling. Saunders married, moved to Memphis, Tennessee, started a wholesale grocery company and eventually opened a grocery store of his own in 1914. 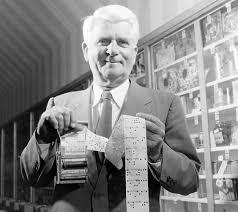 The more he studied the way it operated, the more convinced he became that a better system would improve the shopping experience for customers and profits for the owner. A brass band was playing on Monday, September 11, 1916 as Saunders invited folks into his brand-new store in Memphis. They’d never seen anything like it. The minute you stepped foot inside, everything about this grocery was completely different. 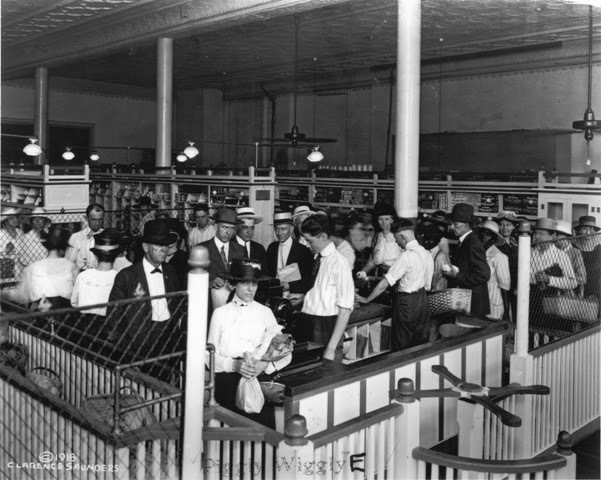 Some 1,000 customers passed through the turnstiles that day and entered the first truly self-service grocery store. Gone were the pesky clerks and counters. Shoppers passed down four aisles where a mind blowing 605 items (way more than competitors offered) were arranged by departments. A nearby stockroom meant shelves were never bare. There was no meat that first day, though butter and milk were available. Prices were clearly printed for comparison shopping. Gone, too, were the pesky scales and weighing of staples: if you wanted a pound of sugar it was already packaged and ready to go. Saunders even provided shopping baskets for customers so you didn’t have to bring your own any longer. True, immediate access to goods meant there was shoplifting; but increased impulse purchases more than offset the loss. The Pig was an instant success. 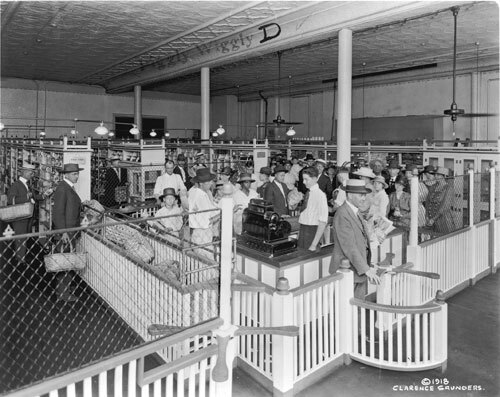 It grew to more than 600 stores by 1921. Just two years later, 1,267 Piggly Wigglys were operating. That same year Saunders began building a sprawling mansion called the Pink Palace. 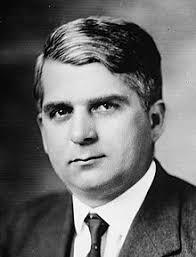 His fortunes suffered a serious downturn after a Wall Street corporate raid on the company in 1923. By year’s end Saunders had lost all his Piggly Wiggly stock, was squeezed out as company president, and even had to turn over his beloved Pink Palace to creditors. In 1930 it became the Pink Palace Museum, the city’s first. Piggly Wiggly went on to grow and profit. But Saunders didn’t. He tried several other ventures, but none ever recaptured his earlier luster. He died in 1953. Today, the Pink Palace proudly displays a recreation of the first store that started it all back in 1916. And Clarence Saunders’ legacy is still with us every time we go shopping. So think about him the next time you take that package of sugar off the shelf, and silently thank his memory that you don’t have to stand there while it’s weighed.